Last week, I got an email from a very well-intentioned reader who told me that he was going to leave a review for my book as long as he thought it was worth 4 or 5 stars. If it was less than that, he would not leave a review, but rather send me an email explaining his problems with the story. I promptly told him to leave the review, regardless of what he thinks of the book. Even if it’s a one-star review. I don’t want to sound unappreciative. He obviously wants to support my work, and wants to help. 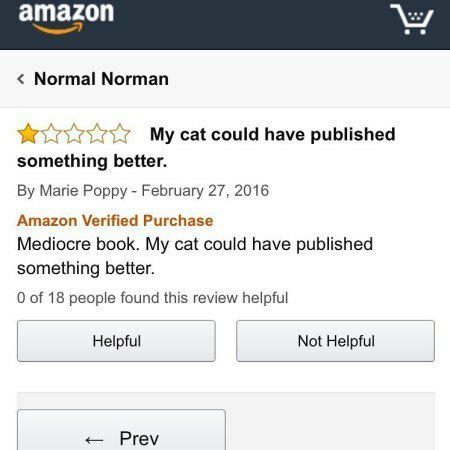 His thought process is sound: I wouldn’t want to hurt his book sales with a bad review. But here’s the dirty little secret about independent authors: we’re actually totally cool with bad reviews – or at least we should be. First, let me back up and be crystal clear about this… we prefer 5-star reviews. Who wouldn’t, right? If you think the book is worth 5 stars, please leave a review! I try to be open about the fact that leaving reviews is the #1 most important thing you can do to support your independent authors, myself included. …or the one with 128 reviews averaging around 3.5 or 4 stars? You see, I could beg, borrow, and steal my way to 34 perfect reviews. I could ask my friends and family to leave reviews and make sure that they’re five-star reviews so that I look good. And it kinda looks good, but it also doesn’t look genuine. A book with 128 reviews of varying scores? That means people are buying this book. It means people are reading this book. And that’s the one that is going to catch more new curious readers. It’s a numbers game. If I have a few five-star reviews but that’s it, I don’t look nearly as well-established as the author with hundreds of reviews. So, to sum up: the best thing you can do for me and to support my business outside of actually buying the books is leaving an honest review. I’ll never ask anybody to leave a 5-star review. I just want them to be honest. Think it was fine, but only worth 2 or 3 stars? Leave the review anyway! Besides giving me valuable data to improve my stories, you’re also lending credibility to my book’s page, which only helps sales. Except, you know, be nicer than THIS.